Black is the go-to color for many things, and especially wardrobe choices when one is looking at a formal event. These cuff links really have nothing to say other than "They're black" and sometimes that's all that's needed. The entire body is made out of stainless steel, IP plated in black to make them even stronger and make sure they last a long time. They're further treated with a brushed finish on the center, so though they don't have any kind of elaborate design, the center will show on the piece of clothing they're attached to and have that little bit of elegance that is expected of you when you're dressing to impress. 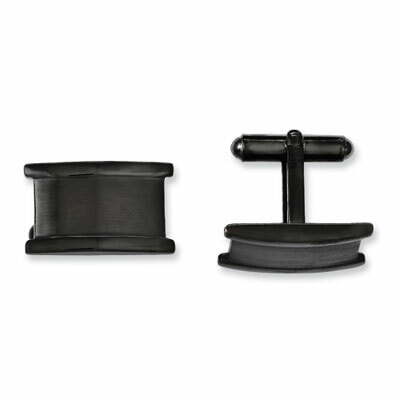 A great evening look these stainless steel black IP-plated cuff links are an elegant addition to a suit and tie. Cuff like have a brushed finish center with high polished edges. Cuff links measure 21mm (13/16") x 13mm (1/2"). We guarantee our Black Stainless Steel Cuff Links to be high quality, authentic jewelry, as described above.